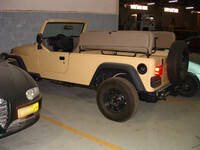 Leo's modified Jeep, BETTER pictures coming soon! Last changed on 03/22/16. This album contains 8 items. This album has been viewed 2495 times since 04/22/05. 1,200 Kilometers on and off road. 2 days. 1 car. The goal was to start in Muscat, reach Turtle Beach, cross into the wahiba, then cut accross to Jebal Shams, going up one side for the main peak and then taking the route that crosses through Bilat Sayt and into Wadi Bani Awf... Then get back to Muscat having gone full circle. Despite a 4 hour set-back from a flat tire where we backtracked to a village to get it replaced, only to find the store was shut until 4:00 pm, we made it! Last changed on 01/25/17. This album contains 72 items. This album has been viewed 11727 times since 03/30/05. 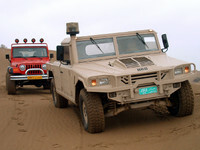 This Arab American Vehicles (AAV) long wheel base Wrangler is built in Egypt for the Egyptian military. It "features" a stripped down interior with no stereo and no airbags, low-back seats with lap-strap seatbelts, and fold-down bench seats in the rear. Various pieces of trim plastic are left out and the carpet is non-existant. There's no roll cage so I assume custom ones will be made. 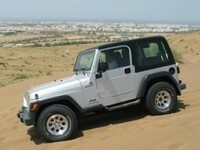 There are 4 of these vehicles in Oman for testing, and apparently it's going well so far! Last changed on 01/25/17. This album contains 11 items. This album has been viewed 5232 times since 01/12/05. Last changed on 12/18/18. This album contains 8 items. This album has been viewed 2614 times since 01/12/05. The extremely severe earthquake in South East Asia affecting India, Thailand and Sri-Lanka severely, also had an effect on other countries world wide. Oman was hit by unusually rough seas and very heavy rain... 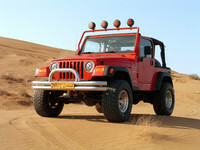 So we took to the dunes! Last changed on 03/09/05. This album contains 12 items. This album has been viewed 5246 times since 12/27/04.